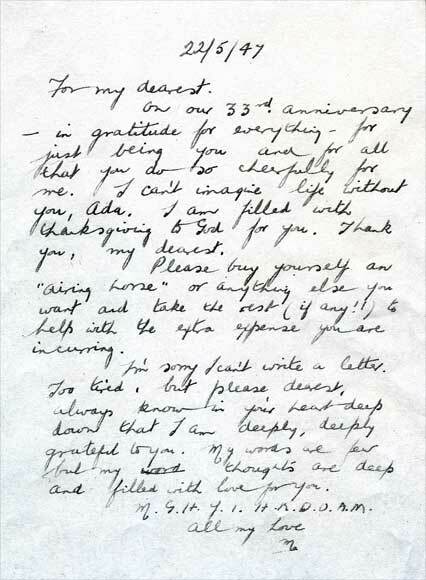 On our 33rd anniversary – in gratitude for everything – for just being you and for all that you do so cheerfully for me. I can't imagine life without you, Ada. I am filled with thanksgiving to God for you. Thank you, my dearest. Please buy yourself an "airing horse" or anything else you want and take the rest (if any!!) to help with the extra expense you are incurring. I'm sorry I can't write a letter. Too tired, but please dearest, always know in your heart deep down that I am deeply, deeply grateful to you. My words are few but my word thoughts are deep and filled with love for you. M. G. H. Y. I. H. R. D. O. A. M.